More than 78,134,090 beer lovers served! 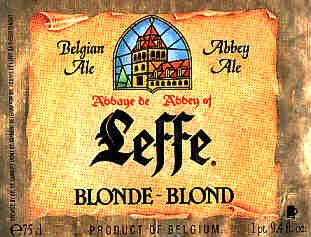 Formerly an abbey brewery, established "anno 1240", Leffe beers are produced by Anheuser-Busch InBev Leuven, and at De Kluis in Hoegaarden. The bottles read "Brewed by InBev for Leffe". Sweet and malty. Fruity, banana. Bready. Medium-big body, fairly fizzy. Sweetly malty, bready, fruity. Bananas and a hint of orange. Clean bready finish. Golden, moderate carbonation, big head. Some mercaptan odor, some malt. Big body, some bitterness. Good flavors. Golden, moderate carbonation, good head. Grassy aroma, honey? Grassy flavor, some malt. Definite honey character. Big creamy body. Sweet and malty and toasty and raisiny. Big malty raisiny finish.